The Alhambra Palace, overlooking the city of Grenada, stands out as the most famous example of Moorish architecture and, perhaps, it is the most well known Muslim construction worldwide. 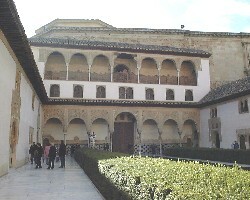 This palace was started after the Reconquista, the reconquering of Spain, performed by the Christian kings. This adds to its aura. 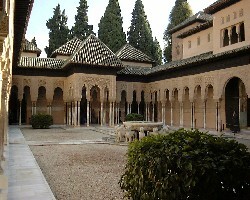 While the illiterate Christians were advancing, Spain reached its highest cultural level ever but under the Muslim rulers. The slender structure of Alhambra, the breathtaking details, the celebration of life, the inclusion of nature in men's design, all underline what tragedy the return of Christianity in Spain was to be for centuries to come. 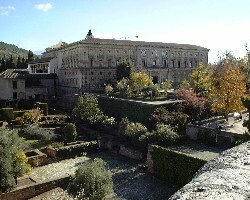 Alhambra was started as late as the 13th century but it consists of palaces built by several rulers, each had his own. The overall idea behind many of the buildings of Alhambra is nothing less than an attempt to create a vision of Paradise on earth. The romantic design is made up of a mixture of slender columnar arcades, fountains, and light-reflecting water basins. Most prominent is the Lion Court. Grenada was lost to the Christians in 1492 and when the Reyos Católicos, king Ferdinand and queen Isabella, died some years later, Grenada was chosen for their burial. Perhaps the Muslim dreams of Paradise even moved the cold hearts of this pair?